Financial marketers will have to make the customer experience their number one priority if they hope to beat back the fintech threat. Traditional banking providers will need the right resources — a combination of both talent and bigger budgetary investments — to leverage data and personalize the customer journey, otherwise fintech challengers could win consumers' hearts... for good. Can traditional financial institutions rise to the challenge and pull it off? A study from Adobe and eConsultancy shows that senior-level decision makers in the banking industry have finally woken up to the threat that fintechs represent, and now concede that everything today — from marketing to the customer experience — revolves around digital channels. According to a study from Adobe, the proportion of financial services companies that viewed themselves as advanced in terms of digital maturity nearly tripled from 7% in 2016 to 19% last year. That’s a huge improvement, but there’s still work to do. 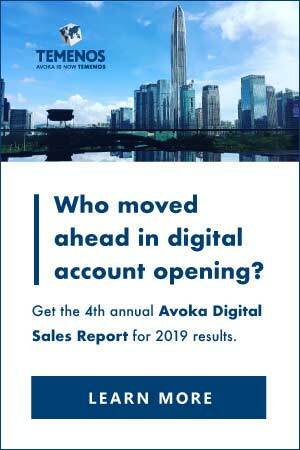 In the study, which encompassed nearly 700 participants from across the financial industry, respondents acknowledged that they must make digital channels their top priority. But to make this happen, traditional financial institutions say they must aggressively ramp up their investments in key areas like data, personalization and AI. The survey revealed that more than a quarter (28%) of all financial institutions rank optimizing the CX as the “single most exciting opportunity” in 2018, and one in three say that “making the experience easy, fun and valuable” will be the primary way they seek to differentiate themselves over the next five years. Survey respondents also see significant opportunities to optimize the customer journey optimization, with 81% saying this will be “very important” over the next few years. According to Chris Young, who leads Adobe’s financial services division, the experience that retail banks and credit unions must deliver need to be as seamless and intuitive as the best e-commerce, ride sharing or food delivery app out there. Young doesn’t mince words when describing how urgent and serious the situation in retail banking is. “Declining foot traffic could be ushering in another retail apocalypse — one that threatens incumbents and opens the door for digital-only brands to take market share,” Young warns. In the report, Adobe says financial marketers must build their business around the customer and focus on personalization. Adobe recommends that banking providers should set up cross-functional customer journey teams to ensure the experience is as seamless as possible across both digital and online channels, whatever the entry point and goal of the prospect or customer. 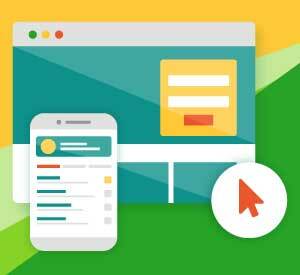 According to Adobe, customer journey mapping can help marketers identify opportunities to optimize interactions and iron out any CX issues that could be alienating consumers and costing the business money. This also requires integrated marketing technology platforms so that data is shared between systems effectively, rather than becoming stuck in channel-specific point solutions. 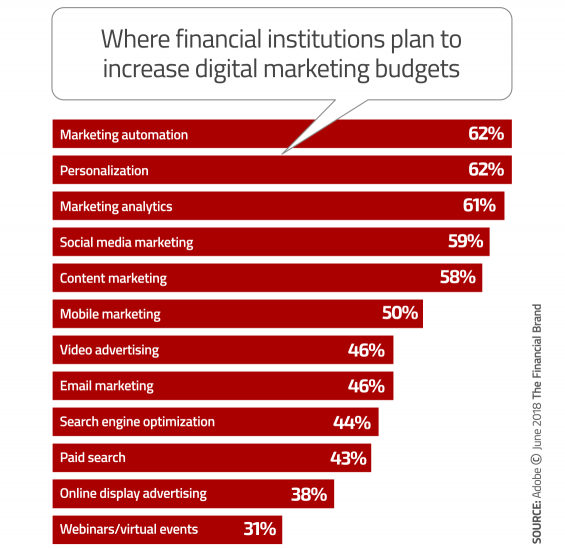 Traditional banking providers are looking to master data-driven marketing through artificial intelligence (AI). In the study, data-driven marketing was ranked as the second most exciting opportunity in the next 12 months. More than a third (37%) of respondents said targeting and marketing personalization were among their top three priorities for the year ahead. 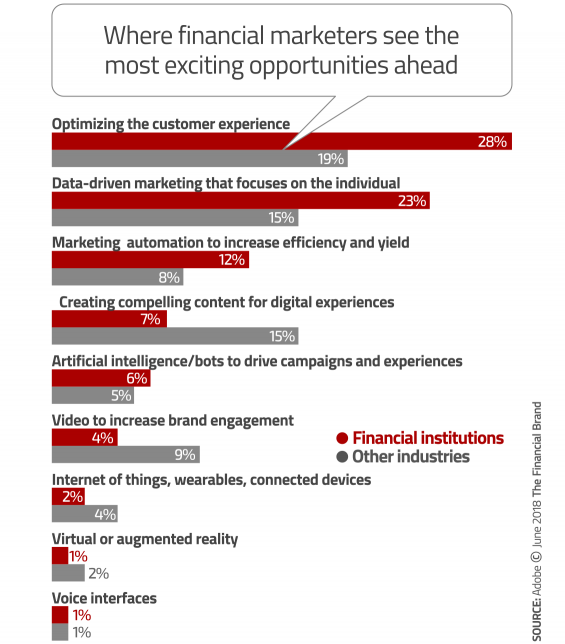 “Financial institutions need to ensure they can surface the right data at the right time, so that their marketing communications become more relevant for customers and predictive of their needs,” Adobe wrote in their report. The majority (61%) of those surveyed say they are either using AI already, or plan to do so within the next 12 months, a percentage that puts this sector ahead of others (44%). Among those currently using AI, at least one in five respondents said they are already using AI to personalize, optimize, test and automate their marketing. campaigns. However, respondents in the Adobe study indicated that there are still significant barriers, citing “building internal resources and knowledge” and “identifying the most effective use cases” as the top obstacles preventing them from fully exploiting the potential of AI. Adobe also says financial brands are neglecting the role content plays in the recipe for creating compelling experiences. According to the study, banking providers struggle to see the value and importance of a content marketing strategy versus their peers in other sectors. The creation and management of content — particularly video content — isn’t something that’s on the radar for the vast majority of financial marketers when compared with those outside of the industry. 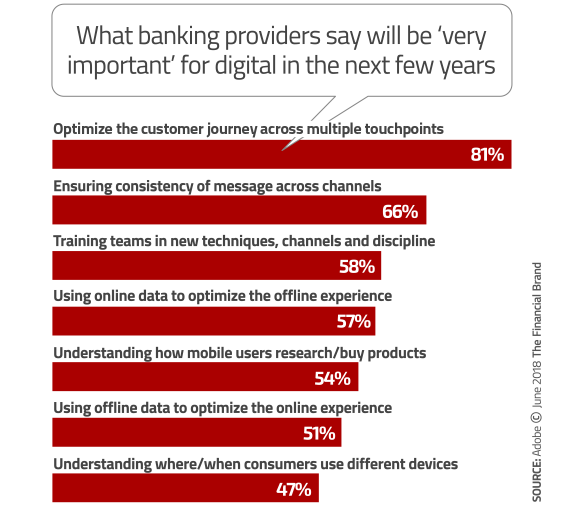 Technology is clearly a major barrier to digital progress for most banking providers. For instance, the proportion of financial institutions that have implemented a highly integrated, cloud-based technology stack is in single figures — a mere 7%. The Adobe report found that top performers are twice as likely to be planning significant investment in digital skills and education of their employees. Young agrees with Plimsoll’s assessment, but says progress is being made. “Investments in digital initiatives are starting to pay off, as established brands are starting to disrupt themselves,” Young notes. Nevertheless, the battle is far from over. “With consumers looking for their banking providers to be available everywhere they are — from mobile and desktop, to new channels such as voice devices — the industry still has a lot of work ahead of them,” cautions Young. This article was originally published on June 26, 2018 . All content © 2019 by The Financial Brand and may not be reproduced by any means without permission.